Family Guidance Center is your community agency, giving support to families and children in times of stress. Founded in 1958 as a counseling agency, it has evolved into a multi-services agency to meet the changing needs of families and our community. The agency provides a range of specialized services for individuals and families experiencing the negative effects of anxiety, depression, divorce, stress, financial problems, domestic violence, child abuse, and other problems that threaten the stability of families. It meets the special needs of children and adolescents, nurturing their healthy emotional development. The agency serves people of all ages, from all walks of life, all socio-economic and educational levels. 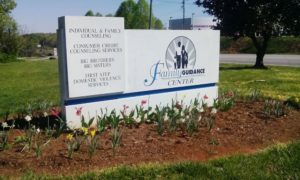 Family Guidance Center is more than an agency, it’s an anchor during troubled times, it’s a lifeline for victims of domestic violence and it’s hope for a better future. Family Guidance Center is the reality of a community’s vision to meet family needs. It was founded in 1958 by community leaders and the Hickory Service League, who recognized the need for support to families. Their vision was for a non-profit, family focused counseling center with service available to anyone in need. In November 1958, Family guidance Center opened its doors…it was the first counseling agency in Catawba County. The agency’s growth and development into a multi-services agency is the result of community involvement, support and leadership in responding to our community’s needs. Family Guidance Center, a tradition of caring. Family Guidance Center is dedicated to restoring and improving the quality of life of anyone affected by personal hardships, domestic violence or sexual assault by providing professional counseling, supportive services and education.